Many people have questions about when and why to change their tires. This article outlines the three most frequently asked questions about tire changes! 1. What's The Deal With Winter Tires? On snow, ice or cold pavement, the stopping distance of a car with Winter tires can be up to 30 - 40% shorter than a car with all-seasons. Winter Tires are designed to move water. Basically, when a tire presses down on snow or ice, it melts the top layer, which creates a thin film of water (the same way a skate glides across the ice). If the water is not moved away from the area in front of the tire, the car will hydroplane. This is why winter tires are covered with grooves, which move water away to the sides, allowing the tire to stay in contact with the surface. It’s about temperature, not snow. Winter tires should be installed when temperatures are expected to drop to 7°C or below. As the temperature falls, the rubber in summer and all-season tires becomes inflexible, reducing their traction. 2. What Are The Dangers Of Worn Tires? Heat Build Up - As the treads on your tires wear down, there is less space for the air to flow between the grooves of the tread to cool the tires. The tire will heat up. Heat is an enemy of rubber and a major cause of tire failure. Puncture - A thick tire tread protects the tire casing from damage. If the tread is worn, it is much easier for something sharp to reach the casing, and puncture the tire. If this damage causes a sudden blowout, you will lose control of the steering, which may cause an accident. Hydroplaning - Deep treads bite into water to keep you on the road. Worn tire treads can cause the tires to skate across a wet surface instead, which is called hydroplaning. This problem can begin when you still have as much as 5/32” of an inch of tread left. Air Leakage - Tires with worn treads are more likely to leak air and lose air pressure, which in turn can affect steering, braking, and fuel economy. 3. How Do I Know When I Need New Tires? If you feel yourself begin to lose traction or fuel economy, measure the tread depth of your tires using ‘The Penny Technique’. Insert a penny, head pointing down, between the treads at different parts of the tire. If you can see the top of the head, your tire needs to be replaced. 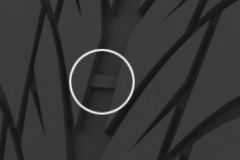 All new tires sold in Canada come equipped with a Tread Wear Bar, which is a small but raised bar that runs across the grooves of a tire tread. They kind of look like small bridges that connect the ridges on the tread. When a tire is new and the grooves are still deep, these bars are very hard to see but, as the tire begins to wear, these bridges become more visible, and as the tread bar becomes level with the tread, your tires are considered legally bald and need to be replaced. Minto Auto Centre Offers FREE Storage For Tires When They Have Been Changed! Book Your Appointment Today! Call 519-338-2017 To Get Your Tires Checked While Your Oil Is Being Changed!